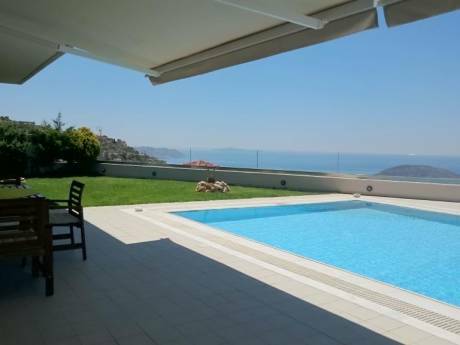 The villa is built to bring in the summer breezes and to fully appreciate the stunning sunset views. Modern amenities are limited to a basic, fully functional kitchen, hot water and lighting. There is no televison, computer or telephone- but there are many English novels to read. The two bedrooms are bright and airy with high celings and doors that open to the terrace. The master bedroom has one queen size bed, the second bedroom has two twin beds and a small baby cot, the living room has one queen fold out couch and a twin fold out chair. The kitchen/ dining area and living room are all one large room with high ceilings and a charming fireplace. The terrace itself wraps around the house and has one large dining table and a small sitting area. Below the house, and at the edge of the rocks by the sea, there is a charming circular patio that is a treat all in itself. If you are traveling with a large group, in-laws or a nanny, there is a separate studio apartment set behind the main villa. It has it's own kitchen, bathroom and patio and can sleep 2 in a queen bed and 1 in a small fold out couch. We also have a large, beautiful home in San Diego, California available to trade. It has 4 bedrooms, 4 bathrooms and 2 offices and is located 1 mile to the beach in the quaint beach town of Encinitas, California. It is kid friendly and has a swimming pool and spa. I am a Greek/American mother of two lively boys (5 and 7) and my husband is an English Litarature teacher. We travel to Greece from California each summer and try to do a side trip along the way. This summer, 2008, we will be traveling through Italy (Venice to Rome) from July 29th until August 7th and would love to trade houses. The dates the Greek Villa is available would have to be confirmed since we also rent it out when we are not there. The San Diego house is our main home and we can make arrangements any time of year for your consideration. We also like to travel to Mexico, South America, anywhere sunny and warm OR somewhere with snow during our Winter Holiday Dec 26, 2008 until January 3, 2009. Our summer home is an idyllic retreat. 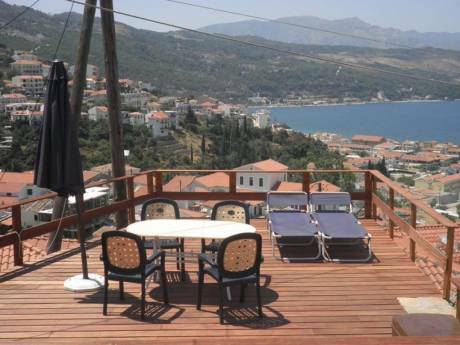 It is located amongst an olive grove and pine trees and situated directly above the sea. Over the years the trees have provided the villa with a privacy screen from any beach goers and can only be spotted from the sea or from above. 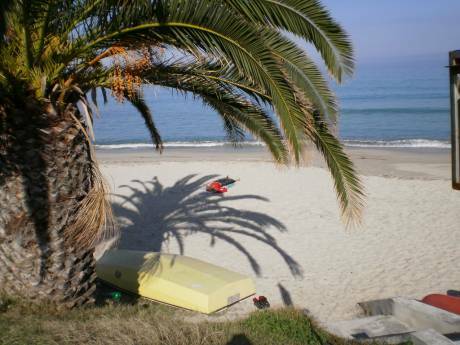 The property is over 6 acres with direct sea access and a few minute walk to a lovely beach. It is rather remote and accessed via a dirt road.